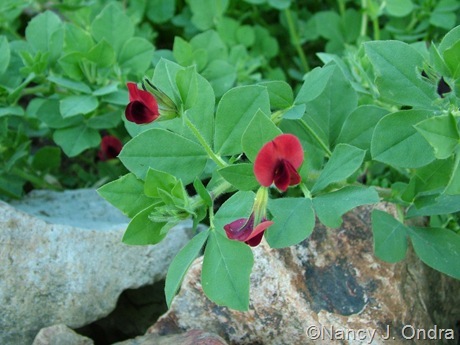 I’m always on the hunt for plants that really earn their space in the garden, so when I ran across a listing for asparagus pea (Tetragonolobus purpurea; also known as Lotus tetragonolobus), I knew I had to try it. The description said that the plants liked heat, so I gave them a head start by sowing the seeds indoors on a heat mat in March and set them out about 1 foot apart in the third week in May. They sat there for about two weeks, then they starting shriveling up one by one. By mid-July, there were only two plants left, but they really were beauties, eventually dotted with tiny but intense, deep red flowers against pale green leaves. By late summer, the flowers started maturing into four-winged pods. The first one I tried was woody and inedible (I guess I picked it too late), so I tried a smaller one and found it quite crunchy and tasty. By frost, I’d gotten probably 8 pods in total: nice for occasional snacking but hardly qualifying as a harvest. The original seed description suggested supplying a trellis to support the plants, so I’d done that. They didn’t climb, though; the trellising mostly just served to prop up the shoots, which otherwise would have stayed close to the ground. 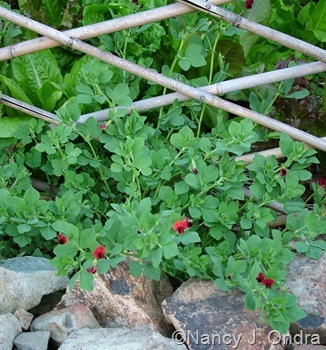 I do plan to grow asparagus pea again, just because it’s so pretty, though I don’t expect to pick much. I think it’s plenty hot enough around here in the summer, but I guess the plants want even more heat than our southeastern Pennsylvania summer can provide. 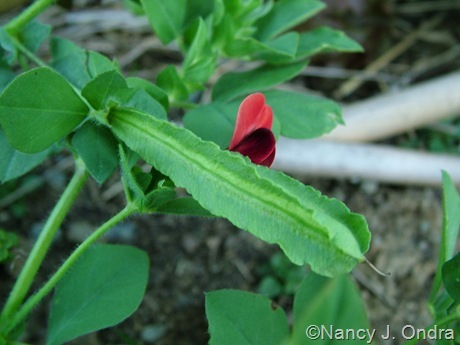 If any of you out there have grown asparagus pea successfully, I’d love to know how it performed for you and whether you started it indoors or direct-sowed it. If you haven’t grown it but want to try for yourself, you can get the seeds from Thompson & Morgan or Veseys Seeds. It never occurred to me to sniff them, Elly; I had a hard enough time getting down to photograph them. I’ll try it this year. Boy, if we could get a baptisia-sized plant with flowers this color, everyone would swoon. Happy seeding! Nan, I have never even heard of this plant, thanks for featuring it. Did you say it did not climb like the english peas or sweet peas? The things the other bloggers can teach us is so exciting. I will try this, it sounds perfect for the potager theme that seems to be running through the threads. I bet the plants would be much happier in your area than mine, Frances, and I think you’d really enjoy growing them. Right, they don’t climb; they made rather loose mounds to about 6 inches tall here. That is an interesting plant. Hope you have more success with it this year. Hi Crafty! I’m afraid it would take a very hot summer for them to thrive here, so if I had a choice, I think I’d rather have cooler temperatures and no asparagus peas. They’re so pretty, aren’t they? I saw them grown down in the Valley, where there’s more heat available, but up here, they’d sit and pout like corn or peppers, etc. The flowers are just so attractive that I WAS tempted, but they didn’t even do that well at an agricultural demonstration plot. Must be something for our more southerly friends to enjoy. I can imagine that they wouldn’t be worth the garden space in your climate, Jodi. I think it’s a toss-up even here. Best to enjoy seeing them elsewhere, I think! funnily enough.. a great aunt gave me these as part of a christmas present (seeds, that is, not the actual peas!). i’m looking forward to trying them. We’re in the North of england, so not exactly warm, but still. I’ll give it a go anyway, and i think i’ll grow them in a warm sunny spot..
very pretty flowers though – thanks for posting! That’s neat, keth! Do try starting them indoors to give them a head start on the growing season. I wonder if it might help to grow them in peat pots to minimize root disturbance at transplanting time. I think I’ll try that myself this year; maybe I won’t lose so many of them. That’s a beautiful plant! It reminds me of marjoram, a bit. Thanks for the info. It might be the plant I need to try in our hot Florida garden! Greetings, Becca! Oh, yes, I imagine it would be quite happy with your summer heat. I’ve just started off some asparagus peas in newspaper pots (first year making these, cheaper than peat pots and so far haven’t disintegrated). I’ve got them in a propagator on our conservatory windowsill and will transplant them when the weather gets a bit warmer. Might try them in a contained. I live in the South of England so quite warm down here most summers (not Florida temperatures tho). Will keep you posted.